Egal, wo Sie sich gerade befinden - mit der um 180° drehbaren, eingebauten 1,3 Megapixel Webcam, können Sie Ihre Visionen überall wahr werden lassen. Die neue ‚Color Shine Display'-Technologie bringt zusätzliche Helligkeit und knackigere Kontraste auf den Widescreen-Bildschirm und mit dem im Lieferumfang befindlichen zweiten Akku bleiben Sie lange mobil. Und das alles bei einem Gewicht von nur 1,6kg. 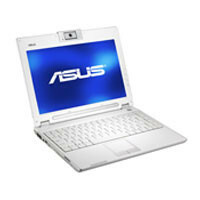 Making a bid for a wider consumer market, Asus has launched its latest multimedia laptop, the W5 (£1408 inc. VAT) directly at the home user. The first sign of this decision comes in the choice of chassis – you can opt for standard black or you can show a little more fl air and choose the arctic white edition. We chose to look at the white version, but both models share the same feature set. The compact nature of the chassis means that at 1.8kg, the W5 is light and easy to carry. For those who need even less weight, a smaller 3-cell battery (£45 inc. VAT) can be fitted, as opposed to the standard 6-cell.